I'm managing for myself a Windows Server 2008 R2 SP1 machine which host things like SVN server, SQL Server, bugtracker, etc. So I was wondering if there is a visual tool, like a daily hour per hour planning to see which task starts up at which hour based on defined schedules in Task Scheduler ? On each row the day of week, on each column the hours, and at intersection each task which starts at the time. I guess this is the daily routine of a network/server administrator, but I am not myself one and I can't afford a professional task scheduler for my simple needs. It could even be better if the tool was able to also retrieve the actual (last) duration of the task, as the scheduler is displaying it. Also, it would be a great feature to have the status of each task (faulty or successful) but both are not a requirement. I hope it's the right place for my question, please let me know if I should ask it on "ServerFault" instead. Not the answer you're looking for? 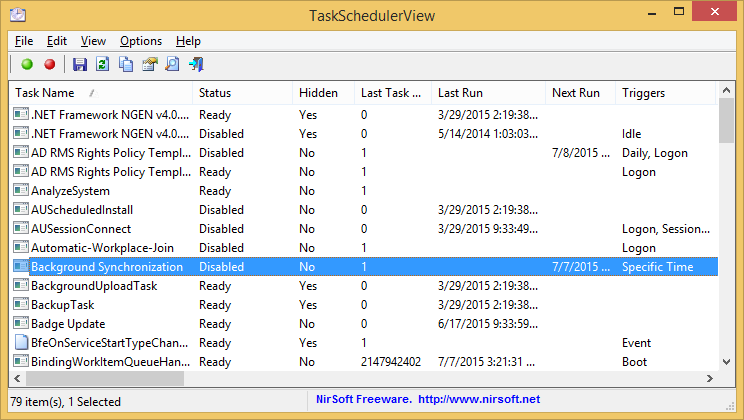 Browse other questions tagged windows windows-server task-management or ask your own question. Open source deployment manager for windows 10 applications, files and database? IDE or command-line tool acting as formatter (beautifier) of custom programming language?